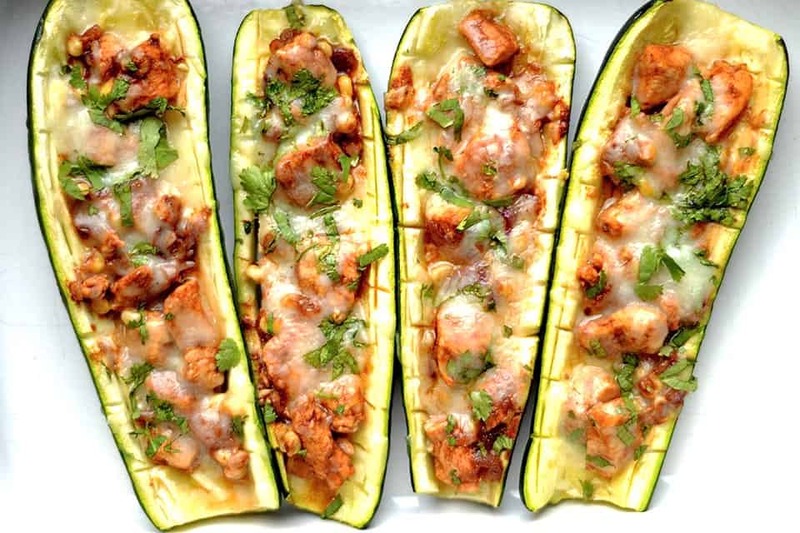 BBQ Chicken Pizza Zucchini Boats have all the same flavor as a yummy pizza without the guilt! A twist on the classic pizza recipe with zucchini to pack in those daily veggies. Have you jumped on aboard the zucchini boat train yet? I was skeptical at first, but only because I have little mouths to feed that aren’t all that crazy about zucchini. But guess what? They are awesome. And what I’ve come to realize is that it’s all about the toppings. I have forever loved a BBQ chicken pizza. Garlic, Melted cheese, BBQ Chicken, onion, and cilantro can just about sell anyone. We often do pizza night on Friday nights, and I wanted to bring about a GF version that the family would enjoy. Verdict: Winner Winner, Chicken Dinner!! I added the BBQ chicken mixture, sprinkled with mozzarella cheese, and topped with fresh cilantro. Bake for another 8 minutes, and they are ready to eat! Best served hot, right out of the oven! Kid friendly tip: My kids tried these and liked them okay, but preferred real pizza. 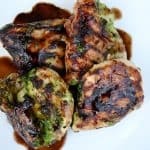 I had plenty of BBQ chicken mixture left after making 6 zucchini boats. I used the leftovers to place on dough so they could have both the pizza and some of the zucchini boats. You could also use ciabatta bread in place of pizza dough! 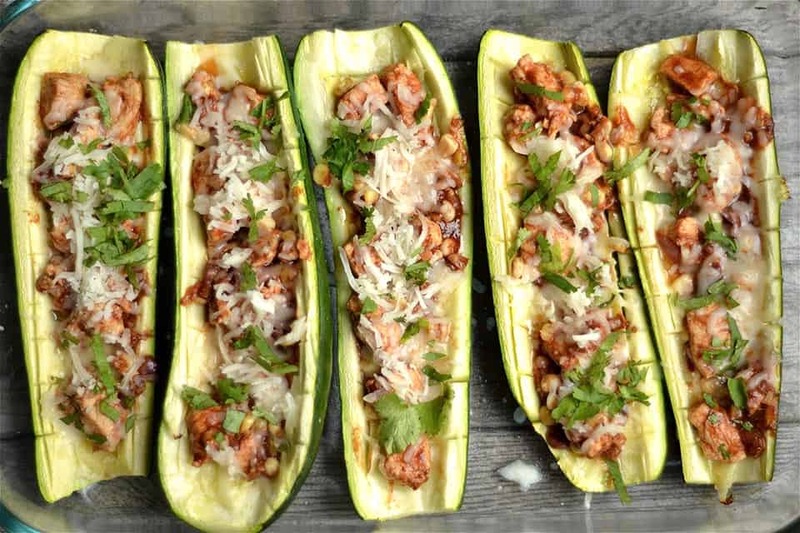 Slice your zucchini in half, vertically so you have 8 zucchini boats. 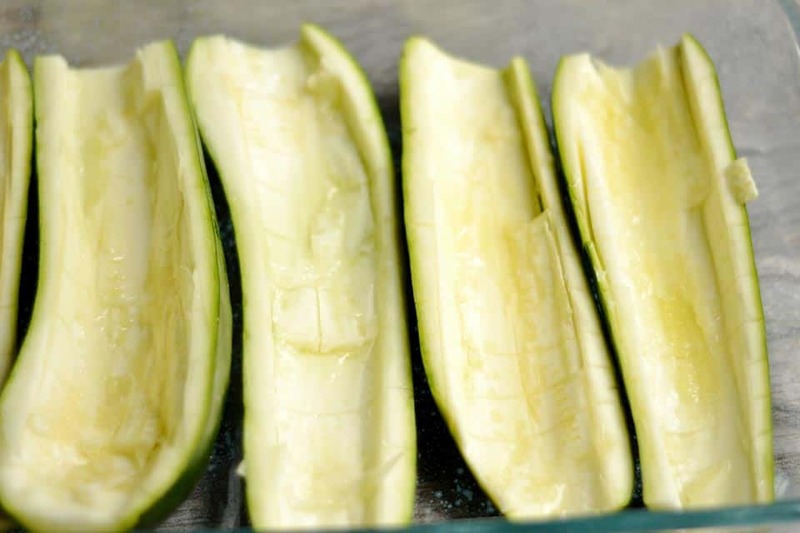 Scoop out the insides by cutting around the edges of your zucchini leaving a rim of about 1/4 inch. In a small bowl, mix together oil and garlic. Brush onto each zucchini boat. Grease a large baking dish, and place each of the zucchini boats inside. Bake for 20 minutes. Meanwhile, prepare the chicken. Cut your chicken breast into small pieces, about 1/2 inch diameter. 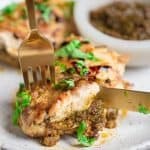 Heat a large skillet to medium high heat, add olive oil, and toss in chicken. Cook each chicken breast for a few minutes per side, until almost cooked all the way (about 4-5 mins total). Add corn and onion. Continue to sauté for another 5 minutes. 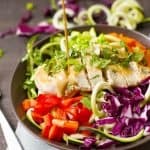 Toss in BBQ Sauce and coat the chicken and vegetables. Set aside. Remove zucchini from the oven. 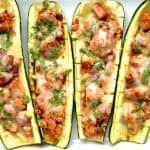 Place BBQ Chicken mixture inside each zucchini boat. 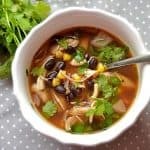 Top with mozzarella cheese and fresh cilantro. Bake another 8 minutes. I like Sweet Baby Ray's brand for a GF version of BBQ Sauce. 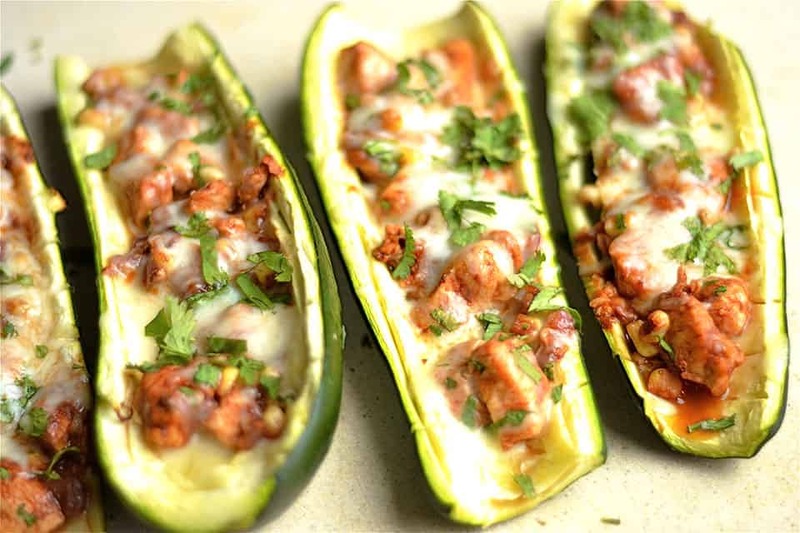 I have another great recipe for stuffed zucchini but we only have it in the summer as I can’t find zucchini big enough to stuff. I have to grow my own.